Delightful Island Hideaway. Private Retreat. Great central location. 3+ Bedrooms, 4 en suite bathrooms, & powder room. Your own private acreage! Every bedroom has its own bathroom with Japanese soaking tub and walk-in shower. Sliding glass doors lead to a patio off each bedroom. The great room has a fireplace, and wonderful views into the forest and lawn. 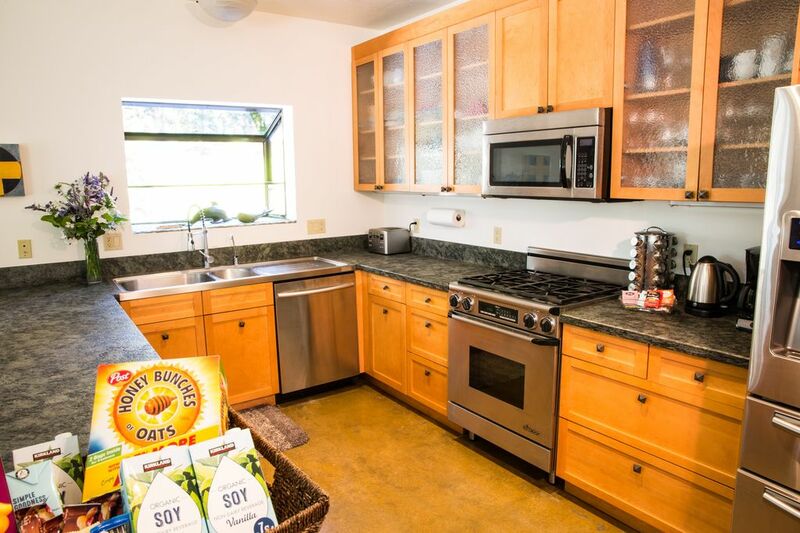 The well equipped kitchen has stainless steel appliances, large sink, and eating bar. Mid-century teak dining table seats 10. The patio features a Weber gas grill, and seating for 9. The gracious entry has a comfortable seating area, plus teak benches and lots of space for shoes, coats and gear. Full laundry facilities are available for guests. The acreage includes a large lawn area, outdoor fire pit, trails to explore the meadow and forest and small wildlife pond. The Inn features original art by local artists, locally made soaps and lotions, and Paul Mitchell hair care products. On site managers can help you with advice and reservations for your island adventures. (or leave you alone). We've been islanders since the mid 1970's. Steve is a landscape designer. See our company's work at and find us on Houzz (search for Island Gardens Company) Jeannie is a certified yoga therapist. She teaches at Island Soul Studio ( and leads retreats and workshops locally and internationally. Last year we sold our farm where we had lived for 32 years. toilet, Located in hallway between entry and great room. Forest Path Inn is on 16 private acres. It is conveniently located halfway between Friday Harbor and Roche Harbor, and close to Duck Soup Inn. Ooma phone service. Free long distance in North America. In floor radiant heat. Each room has it's own thermostat. Electric log indoor fireplace.can be used for additional heat, or enjoy the ambiance without heat. Outdoor play are includes basketball hoop, corn whole, horse shoes and field boccie ball. Hiking trails. Each of the rooms has a 32" smart TV, the great room has a 55" smart TV. Large open area around the house. All rooms have private patio, the great room has a patio with BBQ and 2 dining tables, and an outdoor sectional sofa. Golf course is a short drive away. Forest Path Inn has on site managers, Kate and Jason. They can arrange catering, housekeeping services, massage appointments and help with dinner reservations. The Inn features local art. Our lotion isi also Island Made (and fabulous). Jean’s house was perfect for two families with kids. Comfortable, and quiet and perfectly positioned between Friday harbor and Roche. We loved it and will be back! The property is located between Friday Harbor and Roche Harbor, which makes it easier to travel and enjoy both places. We love the house, it is thoughtfully designed, spacious and homey. The beds and couches are comfy, the sunken tub in each bathroom is great, the kitchen is spacious and equipped, the dining room and living room have plenty of seating. The open layout and natural light makes it ideal for indoor family bonding. The backyard is wide and leads to trails, we enjoyed watching the family of deer every morning. The owner is very responsive and accommodating. She gave us tips on good places to eat and shop, and was flexible with our arrival schedule. We also appreciate the welcome basket of breakfast, snacks and fruits. Thanks Jeannie! The property managers are also very nice and helpful. Overall, staying in this property made our first San Juan Island visit more special. We'll definitely come back again. Forest Path Inn is the perfect locale for a mixed group of introverts and extraverts! While among beloved family and friends, I could still slip away unobtrusively to blessed privacy in my private room with private outdoor exit and private 4-foot-deep soaking tub! Refreshed, I’d wander back into the main room to rejoin the party. Meanwhile, the extraverts had plenty of space to spread out and lounge and cook and talk and eat and play games and be all together. Forest Path offers the perfect balance – together time and alone time. And outdoors – in the forest, but in a clearing in the forest, so all-day sun and light! I’d return there in a heartbeat. This place is absolutely gorgeous, and really peaceful! It is much larger inside than I was expecting, and each room has it's own private bath. The tubs have the most incredible jets and fills from the ceiling! It was such a neat little experience sitting in the tub in the evening with the lights low and watching the deer come up to the back deck. All the beds are extremely comfortable and there are plenty of extra sheets and blankets for those colder evenings. The kitchen is quite large and great for family cooking, complete with GAS STOVE! (a huge plus for me.) Each morning started with a cup of coffee on the back deck immersing myself in nature. The property is large and has multiple little walking trails for exploring. The property managers are also very friendly and accommodating. I will be back to stay again!